Afzal Guru's hanging showcases phony drama, crocodile tears and genuine grief. Aditya Raj Kaul paints an evocative picture. “We all are Afzal”, read a poster held tightly by a JNU Kashmiri Muslim student at a hurriedly-organised protest march by pro-separatist and ultra-leftist groups in New Delhi’s Jantar Mantar, hours after Mohammad Afzal Guru, key conspirator of the attack on the Indian Parliament in 2001, was secretly executed at Tihar Jail on February 9. The air was full of anger, betrayal and fury. ``We won’t forget our martyr”, proclaimed a poster held high by a Kashmiri girl in a veil. By the time the protest was dispersed by the Delhi Police personnel, Guru’s last rites had been carried out inside Delhi's high-security Tihar central prison and the Kashmir valley was clamped down under a curfew not seen since the tense summer months of 2010. Naturally, it was a busy day for all who have a stake in the omnipresent Kashmir story, especially in the Indian republic's capital – and there are many. While TV anchors tried to grab brownie points by determining the timing of when Guru had been informed about the hanging, a speed post was silently booked by the government at the New Delhi GPO in the name of Tabassum, wife of Afzal Guru, telling her what the world already knew. Shockingly but not surprisingly, in this age of online mobility, the speed post reached Baramulla in Kashmir precisely three days after Guru’s death. There is little doubt that the action on Afzal Guru has been carefully crafted in the run up to the 2014 General Elections. To stave off immediate repercussions in the valley, the government ensured that the three key vocal separatist voices in Kashmir were sent on guided vacations. 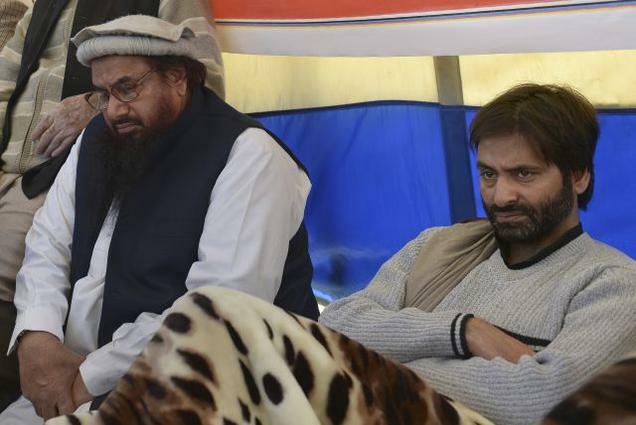 JKLF chief Yasin Malik, a self-confessed terrorist claiming Gandhian lineage, was allowed to visit Pakistan to pay his in-laws a courtesy visit; eventually he sat on a hunger strike at the Islamabad Press Club against the hanging, in tandem with who else, but India's most-wanted terrorist Hafiz Sayeed, himself on a courtesy call to Malik. Hurriyat hawk Syed Ali Shah Geelani, never happy with Kashmir's harsh winters, decided to stay put at his daughter’s Malviya Nagar home in New Delhi, as did chairman of the moderate faction of the Hurriyat Conference, Mirwaiz Umer Farooq, at his apartment in south Delhi's Kalkaji area. Both of them were under house arrest by the Delhi Police and all efforts to reach them by TSI have so far remained fruitless. While India’s liberal elite mourned the death of a man who they called victim of a “flawed judicial process”, the right-wing swung into action as only they can - by a liberal distribution of sweets and an even more liberal thumping of chests. The BJP, woken up from its slumber and rounds of internecine warfare, stood with the government, but added a caveat saying the hanging was `12 years too late'. The National Conference (NC) and the People’s Democratic Party (PDP) – both in direct line of fire - decided to act outraged, accusing New Delhi of acting in haste without realising the negativity it would generate amongst the Kashmiris. The PDP national spokesperson was seen empathising with the family of Afzal Guru and warning New Delhi of further `alienation' of Kashmiris from the Indian mainstream. As for the oratory skills of Kashmiri analysts and politicians of all shades, their opinions were most difficult to comprehend. Any TV debate, ended inevitably in a fish-market brawl, lacking logic and facts, high on decibel quotient and wholly suited to the demands of light and sound entertainment. According to insiders, when much crocodile tears had been shed in the day time, a few among the moist-eyed separatists decided to hit a posh south Delhi restaurant known for its Kashmiri delicacies - listening to the famous Kashmiri singer Rashid Hafiz, who belted out one popular number after the other. Exactly 29 years after Maqbool Bhat was hanged at the same place and about the same time of the year, it seems the central government has learnt no lessons. Bureaucrats at the Ministry of Home Affairs (MHA) seem to have simply copy-pasted the Maqbool Bhat hanging formula, denying the basic right for the family to even meet Afzal Guru. While there may be wide-ranging similarities between Bhat and Guru, who amongst other commonalities, were recruits of the Jammu and Kashmir Liberation Front (JKLF) and were trained in arms across the border in Pakistan, the UPA government has left no stone unturned to make Guru a martyr for the separatist plank of azadi. The babus of MHA, generally known to engage separatists cleverly, have provided fodder to the virtually dead spectacle of the separatists. Separatists cheerleaders are now crying hoarse from their comfortable bungalows in New Delhi. Afzal Guru, they believe, will be the new Che Guevara - if not in spirit then on on t-shirts. Among other things in question is the legal representation given to Afzal Guru by the state, even though the two-man Supreme Court bench of P. Venkatarama Reddi and P.P. Naolekar found “no substance in this contention”. The same apex court had earlier acquitted Delhi University professor S.A.R. Gilani of all charges in the same case citing technical grounds. “Those who are intervening in the campaign to save Afzal but have no commitment to Indian nationalism are not doing any service to his cause”, wrote Supreme Court advocate and human rights activist Nandita Haksar in her book ‘Framing Geelani, Hanging Afzal’. Her conclusions: “We must never underestimate the appeal of nationalism”. Even though she poignantly remembered and wrote about the sufferings of a prisoner accused of ‘waging war against the state’, the reflections were convoluted with anger, raw emotions and a discourse which few could identify with. A pusillanimous campaign now underway, instead of demanding reform in criminal laws, continues to question the Indian state’s position on Kashmir. Those postulating over the Kashmir issue may do some good by asking local Muslims to internalise on who they strive to be with – a crumbling nation crippled by internal strife or a country which stands for secularism and diversity. A debate within the stakeholders on Kashmir is need of the hour. Not necessarily the Aman Ki Asha model, neither the misnomer of Kashmiriyat, nor even meetings like those organised annually by Dr. Ghulam Nabi Fai in the Capitol Hill, United States, where he invented reasons to abuse India till he was arrested by FBI on charges of being a Pakistani spy. Interestingly, his list of invitees included reputed names from the Indian media, think-tanks, analysts and of course the separatists. In the wake of a threatening attack on the first-ever girls rock-band from Kashmir, Pragaash, and an acid attack on a Kashmiri girl which went almost unnoticed and unreported, the debate becomes vital. “I do realize and regret that due to us (Kashmiri Muslim terrorists), Muslims in the rest of India get a bad name”, said Afzal Guru in a confession aired on TV channels soon after he was apprehended in 2001. The tragedy of intolerance developing in the Kashmiri society, fashioned no doubt by some excesses of the Indian state, is best understood by a Kashmiri axiom ‘anyem soi, wavem soi, lagem soi panesei’, or ‘as you sow, so shall you reap’. Thanks to the government's mishandling of Guru's hanging, it may become an issue of debate and in his death, he may well emerge as the new poster boy of jehad. As Jammu and Kashmir Chief Minister Omar Abdullah put it, the new generation of Kashmiris "who may not have identified with Maqbool Bhat will identify with Afzal Guru”. Aiding and abetting this sense of alienation are celebrity fiction writers like Arundhati Roy, who remarked famously at an event to discuss Freedom in October 2010 at New Delhi, ``bhooka nanga Hindustan, jaan se pyaara Pakistan’ (hunger-stricken and naked India, Pakistan more beloved than life). To prepare such a dangerous cocktail for her Kashmiri brethren in the garb of liberal discourse only does disservice to the idea of human rights and justice. The hollowness of the leftist diatribe, if not put under introspection, may end up aping right-wing fanatical rhetoric and that is not good news. The Indian government may now not just have to open its arms but ears as well by listening to the genuine voices of estrangement coming from various sections of Jammu and Kashmir. The farce of a round-table dialogue which will decide the date of next meeting, does not demonstrate serious engagement. In the days ahead it would be a challenge for the Indian government to contain terror groups from expanding and operating through sleeper cells, as happened months and years after the hanging of Maqbool Bhat in 1984. The judge who delivered the verdict, Justice Neelkanth Ganjoo, was mercilessly killed by suspected JKLF terrorists soon after. Bhat, who was one of the first from the JKLF to cross the Radcliffe Line for training, could well inspire others to do the same; attempt a violent uprising in the name of religion and ensure a recipe for disaster. After all, terrorism, which spread like gangrene, did not mrerely dent Kashmir, it expanded its base to all corners of India, most notably the attack on Parliament in 2001. 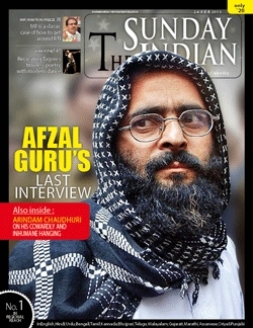 The apex court in its decision on Afzal Guru was very clear. ``The present case, which has no parallel in the history of Indian Republic, presents us in crystal clear terms, a spectacle of rarest of rare cases”, it said, adding, ``the very idea of attacking and overpowering a sovereign democratic institution by using powerful arms and explosives and imperiling the safety of a multitude of peoples' representatives, constitutional functionaries and officials of Government of India and engaging into a combat with security forces is a terrorist act of gravest severity.'' Point is how do you explain it to the bleeding hearts industry?